View from the Birdhouse: Music Monday - 13 Great Halloween Songs That Aren't "Thriller" or "Monster Mash"
Music Monday - 13 Great Halloween Songs That Aren't "Thriller" or "Monster Mash"
Throwing a Halloween party or looking for some fun music to listen to while handing out trick or treat candy? I made a list of 13 of my favorite Halloween songs. Although I like "Thriller" a lot, you won't find it here, and some of the songs you hear a lot like "Monster Mash" are missing too. I went for songs you don't hear as often at Halloween, just to keep things interesting! Just click on the song title link to hear each song at Youtube. "Spooky" - Dusty Springfield (1968). The Classics IV version is best known, but I prefer Dusty's jazzy cover. "I Put a Spell On You" - Nina Simone (1965). My favorite Halloween song, and Nina Simone's version is my favorite. "Voodoo" - Chris Isaak (1987). I confess: Chris Isaak is one of my secret celebrity boyfriends. And I love this song! "Dead Man's Party" - Oingo Boingo (1985). THE Halloween song from my college years. "The Twilight Zone" - Manhattan Transfer (1979). I love them - my favorite vocal jazz group. "Superstition" - Stevie Wonder (1972). One of my favorite Stevie Wonder songs. "Evil Woman" - Electric Light Orchestra (1975). Great 1970's retro song. "Bad Moon Rising" - Creedence Clearwater Revival (1969). I think CCR deserves more oldies music love; they're one of my favorite 1960's bands. "Season of the Witch" - Donovan (1966). A 1960's hippie rock addition. "Hungry Like the Wolf" - Duran Duran (1982). Some new wave dance fun! Not a traditional Halloween song, but if you listen to the lyrics, it fits into this list. "Witchcraft" - Frank Sinatra (1957). 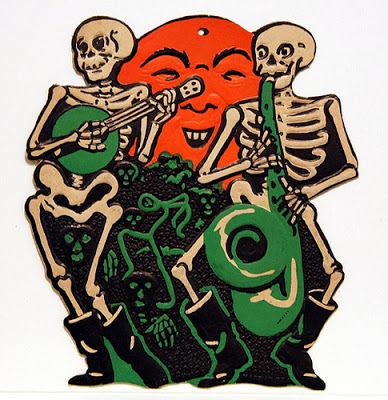 A cool jazz addition to your Halloween playlist. Love Sinatra. "Cat People" - David Bowie (1982). One of my favorite Bowie songs, and also one of my favorites for Halloween. "Bewitched" - Peggy Lee (1965). Yes, it's the TV theme with lyrics! What are YOUR favorite Halloween songs? I'd love to hear from you in the comments, below. GREAT post! Love the selections. Such great picks! Witchcraft is my favorite! I have heard of a few of these songs but a lot I have not. Great picks!!! Excellent songs here's another for your list-Devil Woman by Cliff Richards!! So many good ones! I love I Put A Spell On You! Oh how fun are these! I forget about all the fun Halloween songs!! I love this! We had on Halloween music all day yesterday and we definitely could have added some of these! What a great list! These would be super fun for a Halloween party. Thanks all! I enjoyed hearing about your favorites. Hope you had a fun Halloween!